How is it possible to add attribute on the category page? perfect, I could add text to mark the category editing controller and tpl files. How do I add the link to be directed to the list of products this brand? I dont understand what you mean. florinsith wrote: I dont understand what you mean. I never used opencart before. I needed to display the manufacturer in the featured products in 1.5.x version. 2) In the view featured.tpl I inserted <?php echo $product['manufacturer']; ?> where I needed, inside a div, like said florinsith but, not worked. 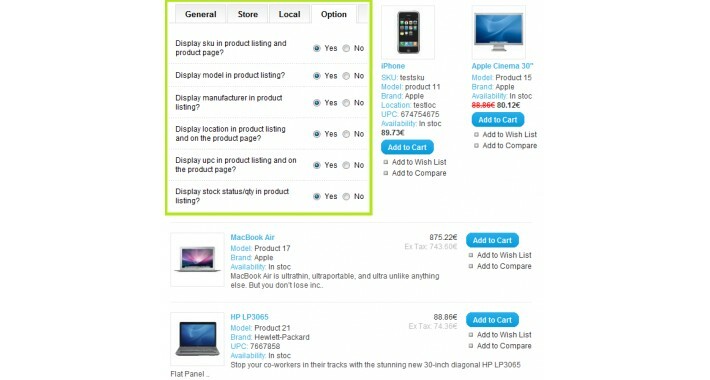 Here the ridiculous part, it worked but, as I did not know the opencart confuse me with the manufacturer field. I am writing this to warn those who like me have "forgotten" or confused the field [manufacturer] with the form of products. Each field will display in admin anly if you seted so from admin > system > settings > main store > options tab. And for each product , each field will display if it has something inserted in admin. As for installation , just drop the downloaded xml in your vqmod/xml folder and you are set. Then navigate in admin , in the place mentioned above and set the fields.